RC Radio: The Carnival, where is that Holiday? In this place you can experience the concurrent holiday that is going on in physical reality. It is a place where these energies are anchored, so that they can be used in physical reality and drawn upon. The Carnival is lots of fun any time of year. It is a good place to unleash your inner child. Consciousness loves to play and have fun. Here you get a full dose of fun, depending on what holiday is going on. You get to the Carnival from the train at HAS. It will stop there, just keep your intention on going to the Carnival. It is located in Malkuth so it will be very earthlike, full of rich green trees and fields. It even has streets and cars, people and is often a very busy and fun filled place to visit. Visit here anytime you need a pick-me-up and want to inject some fun into your spiritual journey. Halloween / Day of the Dead: During this time the Carnival is full of everything ghoulishly fun. Pumpkins, ghosts, bats. Witches, even the deceased. Because this holiday is linked with the Day of the Dead, you can visit with past loved ones that have left the earth. There are a few places in the Tree of Life where you can meet up with passed on souls, however the Carnival at this time is by far the easiest place to meet them. 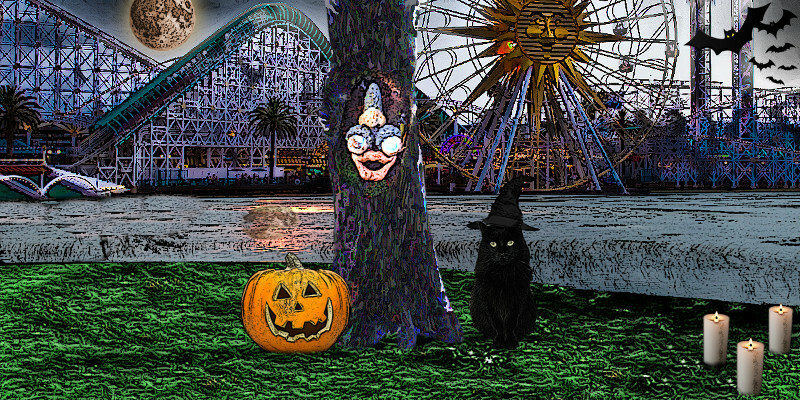 Talk to the “Witch in the Tree” for some ghoulish advice. Or the “Jack O Lantern” to find out your greatest fear or weakness. The “Black Cat of Unlikely Surprises” may be able to bring you something unexpected, if you ask nicely. Christmas: Experience the Christmas energy of brotherly love and childlike innocence in this wonderful holiday. See also the Christmas Village. New Year's Day: Visit also the Restaurant at the End of the Universe for this Holiday. But you can also visit the Carnival as well for some New Year fun! Valentine's Day: Ride the Ferris Wheel of Hearts and get advice from the Tallman. See how strong your love is by hitting the gong of love. On the bottom left is the “Botanical Gardens Theater of Life”. Go here to engage in playful acting in your favorite tv show or any storybook or fairytale character. Want to command a star ship? Go here and become Captain Kirk of the Enterprise. This place is best entered in OBE for full immersion, but travel mediation will work too. There are always spirit rides here. Some of them can take you to far away places you have always wanted to see. Take a spin on the Carousel. It will spin you into another reality for fun. The gift here is the energy of fun. Coming here awakens your inner child and brings you back to a more simple time in life. It is a very refreshing place to visit. Depending on the holiday being celebrated there may be other gifts just for that occasion. Cotton Candy: Eating this will nourish your inner child. You may feel playful afterwards.